Data, data everywhere, and all too many spreadsheets to think. Citizens have a new tool to visualize data and map it onto their own communities. Geospatial startup FortiusOne and the Federal Communications Commission (FCC) have teamed up to launch IssueMap.org. IssueMap is squarely aimed at addressing one of the biggest challenges that government agencies, municipalities and other public entities have in 2011: converting open data into information that people can distill into knowledge and insight. 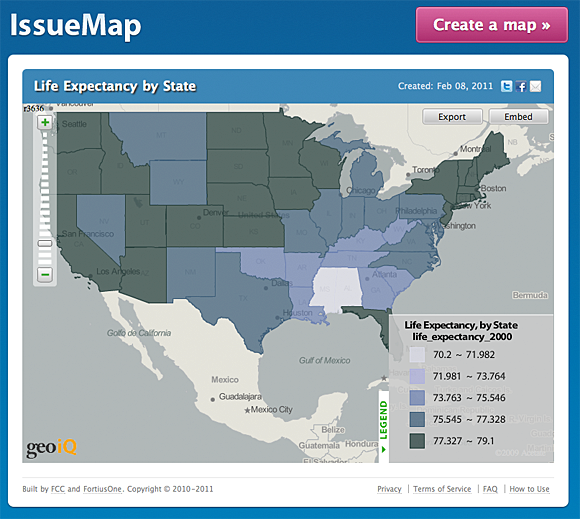 IssueMap must, like the data it visualizes, be put in context. The world is experiencing an unprecedented data deluge, a reality that my colleague Edd Dumbill described as another “industrial revolution” at last week’s Strata Conference. The release of more data under the Open Government Directive issued by the Obama Administration has resulted in even more data becoming available. The challenge is that for most citizens, the hundreds of thousands of data sets available at Data.gov, or at state or city data catalogs, don’t lead to added insight or utility in their every day lives. This partnership between FortiusOne and the FCC is an attempt to give citizens a mapping tool to make FCC data meaningful. Maps are a data visualization tool that can fix a rotten spreadsheet by making the data real and rich with context. By showing how data — and the decisions that produce data — affect people where they live, a map can make the difference between a blank stare and a knowing nod. Maps are also a crucial part of a decision-maker’s toolkit, clearly plotting the relationship between policies and geographies in easy-to-understand ways. Once you’ve found some data you can either upload the spreadsheet (.csv, .xls, .xlsx, .odf) or just cut and paste into the IssueMap text box. Many tables you find online can also be cut and pasted to create a map. The data just needs to be clean with the first row containing your attributes and the data beneath having the values and geographies you would like to map. Even if you muck it up a bit IssueMap will give you helpful errors to let you know where you went wrong. Once you’ve loaded your data just select the boundary you would like to join to and the value you would like to map. Click “Create Map” and magic presto you have a thematic map. Share your map via Twitter, Facebook or email. Now anyone can grab your map as an embed, download an image, grab the map as KML or get the raw data as a .csv. Your map is now viral and it can can be repurposed in a variety of useful ways. One of the most powerful ways humanity has developed to communicate information over time is through maps. If you can take data in an open form (and CSV files are one of the most standard formats available) then there’s an opportunity to tell stories in a way that’s relevant to a region and personalized to an individual. That’s a meaningful opportunity.